U2 > News > Next Up - Mexico! Thirteen years ago Mexico City was the scene of a legendary live show by U2. PopMart was the tour, and that 'sci-fi disco supermarket' was caught for ever in the DVD PopMart (Live From Mexico City). One of the stand-out tracks on the 1997 tour was Even Better Than The Real Thing, recently reimagined to open U2 360° in South America. 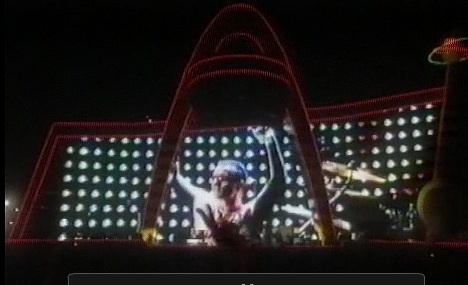 Here's what Even Better Than The Real Thing was like on PopMart. I hope you’ll have the same great time as we had here in Brazil last month. The 360 degree tour is amazing and the 360 degree stage design really let us see the band from anywhere. U2 rocks!!!!!! Happy Birthday, Bono…. You were born to sing for the world, to enchant us with your Bonavox whatever song you sing you magnify our pleasantness and leave in us such a mark of love that unites our hearts Happy birthday!!! THIS IS YOUR DAY, YOUR DAY.. SO HAVE A GOOD DAY MAN!! Happy Birthday BONO and thank you and all the members of U2 for making the best band in the world. THANK YOU from PORTUGAL. Desde Santa Fe, Argentina, los mejores deseos para vos. Feliz cumple!!!!! Prepárense mejicanos para disfrutar de un show increíble, del que tuve la suerte de participar en La Plata. Besos!!!! Acrobat would be a great surprise in the play list. Tha band has already amazed us with tunes we thought we would never hear played live. I hope I can hearUV and No line on...unos,dos,tres..catorce de Mayo !! Hi, guys! I´m so glad to see you again in our amazing city: Mexico. Your concert is my own birthday present and I´m very happy to see you again. Also, it´s the 1st concert for my baby (I´m pregnant). She is your younger fan in the hole world (she dances when I´m listening your music). You are the most wonderful band in the world. See you on saturday May 15th! Play "Stay"... and... "Kite". Adam, Larry, Edge & Bono... If you know Mexico is an amazing place to play, you should play something out of the script... see you soon. U2, thank you guys for the great surprises that you have give to all the fans during this tour. Special Thanks for playing Zooropa,Mercy and Your Blue Room. My wife and me will be in the azteca on May 14th and I ´d like that my favorite band play new year´s day like a special present for my wife.she couldn´t be in Monterrey in 2006 for an operation,now this is a great oportunity for us to engoying together your music.thanks bono,the enge,adam and larry thanks for comeback.. Heading to Mexico City next week,hope there are still some tickets available for one of the concerts!! U2 guys please record a DVD on 15 May. These concerts will be the most grandiose of all the tour. We will be more than 280,000 people in three concerts!. Think about it. Make this dream come true, For us. We ask them to heart! Please, please, play Mercy and Bad pleaseee, see you guys next wednesday, saturday and sunday !!! I just love the performance of UV back in 1992 with the previous phone call "...Baby,baby,baby.. light my way "
I went to the 2nd. concert from Vertigo 2006 in the Azteca Stadium.I think people knew all the songs and lsang even louder than in 1997 and 1992 .Every time the band comes it gets better. Hopefully they would play UV and No Line on May 14th., although Bad is also one of my all time favorites. My name is Mr. Macphisto!!! ...and i´m ready for the night of sunday 15 in Red Zone 1. I have the golden suite, red shirt and de devil horns. Only miss the golden boots with diamond. See you...remember boys: Red Zon 1 sunday 15 Mexico wants to instead listen UV, fly, please, stay, The Ground, Dancing Barefoot (the 3 last never sing in Mexico) Please, Please, Please, Please!!!!! Please guys to those that are going to the concerts next week. ENJOY THE SHOW!! sing happy Bday to Bono as well... Que lo disfruten bastante!! The best on the tour! !